Phoenix, Arizona – August 14, 2012 – Local jewelry designer Matagi Sorensen was recently honored as a Top 5 Finalist in a national competition for emerging jewelry designers. The Halstead Grant program, sponsored by jewelry supply wholesaler Halstead Bead Inc., awards cash grants and valuable business plan assistance to jewelry entrepreneurs. Inspired by nature and the diverse geology of Northern Arizona, Matagi’s jewelry has an intuitive, organic feel and quality. 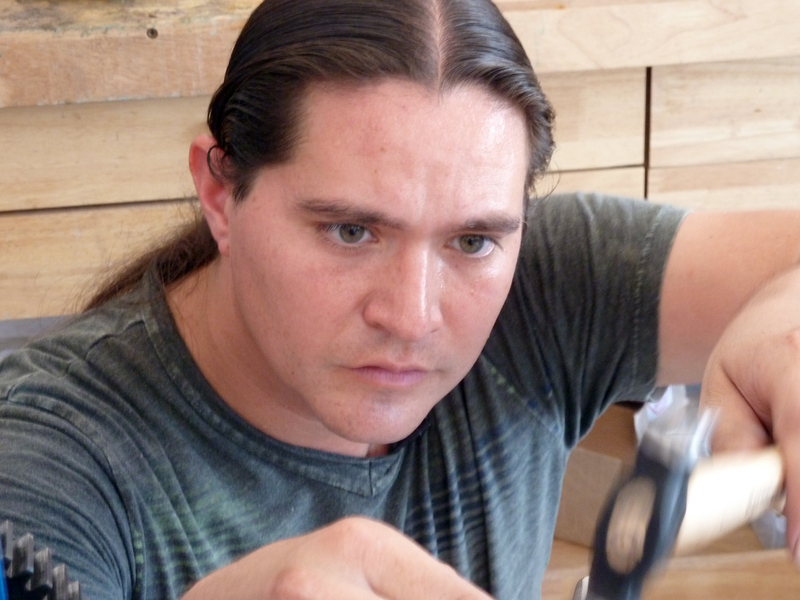 He juxtaposes classic Native American techniques, such as shadow box design, with modern form to create elegant, high-end, hand-crafted silver jewelry that may be worn from the most casual to the most upscale settings. Liking the practicality of portable art, Sorensen began designing jewelry in college, and was hooked when his work started selling during his first semester as a metalsmith student. Since then, his work has been in several juried shows, including the Southwest Indian Arts Fair; he was awarded the Whiteman Family Endowment for the Arts Scholarship; and his work has been featured in magazines, the most recent a bracelet chosen by the Society of North American Goldsmiths for a full-page ad in South Scottsdale Magazine. Matagi’s work can be found in art galleries in the southwest and throughout the country as well as online at his blog, Sorensen Silver Fine Art or his online shop, Matagi Fine Art. Retail prices for sterling and fine silver items range from $28 to $2500.00. Sorensen was chosen as a finalist out of a highly competitive field of submissions from designers all over the United States. “Matagi’s line consists of beautifully crafted pieces of fine jewelry that blend traditional Southwestern jewelry elements with a new contemporary aesthetic” said competition judge Hilary Scott. Entrants in the competition were required to submit a jewelry portfolio and business plan details. The program is designed to support the dreams of talented jewelry artisans and encourage sound business practices as they build their small businesses. Detailed results and more information on the award are available at www.HalsteadBead.com/Grant. Next Post Topaz Tao Pendant – Blue Skies! Also, your photographer does a beautiful job. You are getting famous Matagi, I am proud to be your (and Holly’s) friend. Leo, I am proud to be your friend too.